Physical therapy is the treatment of injuries, pain, and disabilities with the goals of restoring, maintaining and promoting function. 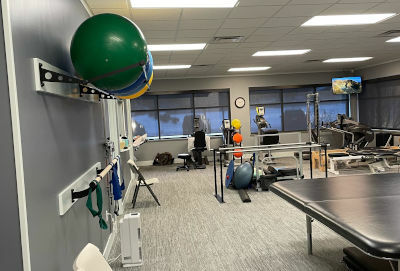 Physical therapy begins with a thorough evaluation by a licensed physical therapist to determine functional limitations within the musculoskeletal system. A plan of care is created with goals made by the physical therapist and patient in order for the patient to return to their personal level of optimal function. This may be going up/down a flight of stairs at home, going grocery shopping, returning to work, playing a sport, or living life with minimal pain. We work directly with Dr.Rahimi in a multi-dimensional facility to provide the best care for patients with complex medical and surgical histories. We work with complicated and rare diagnoses on a regular basis as well as your "typical" physical therapy diagnoses. We utilize manual therapy as a main treatment intervention, believing that fixing and correcting the origin of cause is necessary first and foremost. Our physical therapists have extensive continuing education training in manual therapy. Our licensed physical therapists are professional health care providers who have extensive education (Doctor of Physical Therapy and Masters of Physical Therapy degrees) to evaluate and treat musculoskeletal conditions. We also have licensed Physical Therapy Assistants on staff with specific college level degrees. Our PTAs work directly with our PTs to provide the best comprehensive care for patients. At WMRPC, we utilize hands on skills to work on physical therapy goals. There are many areas of manual therapy that are appropriately used together or alone to treat patients. Manual therapy consists of specialized hands-on treatment to assist with range of motion, strength, flexibility and function. This type of therapy creates movement of the spine and joints, decreases muscle tightness, releases trigger points, releases restrictions in fascia and connective tissue, and facilitates muscle activation to function correctly without pain. Specific manual therapy techniques used in our clinic include: deep tissue massage, trigger point release, joint mobilizations, muscle energy techniques, myofascial release, neuromuscular re-education, manual traction and strain-counterstrain techniques. Our therapist take continuing education coursework through Michigan State University-College of Osteopathic Medicine in their Manual Medicine Series that service DOs and PTs. We see patients internally (referred from Dr. Rahimi) and externally (referred from another doctor). We also see patients who self-refer via direct access. Starting in January 2015, patients are able to receive PT treatment without the required script of a doctor. However, there are some insurance restrictions to this rule. If you would like to be seen for physical therapy, please contact us and we would be happy to help answer any questions. If you would like additional information please submit a Physical Therapy Consultation Form or call us at 616-447-4090.